SG is an Manolo fan and usually can't find anything wrong with the collection. So, last season, when this showed up, I was a little surprised. Now, imagine my surprised when I see not one but 3 of these camouflage print shoes by Manolo Blahnik. I saw a pair of thong sandals in person during Neiman sale, and didn't have the urge to give them a try. Why Mr. Blahnik, why??? Am I missing something, I ask you this savvy gals? I once had a pair of cheap Payless ballet flats that were camouflage that I thought were kind of cute, but these are ridiculous! You are definitely not missing something. 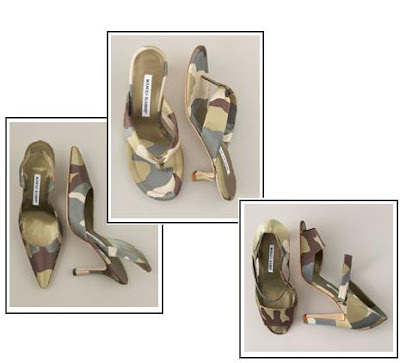 I ADORE Manolo's, and don't mind paying for them, but I would NEVER spend $600 on camo heels, ever. The shoes remind me of when I got off the subway when I lived in NYC and worked in mid-town Manhattan. There was this beautiful woman (who was probably a model) dressedin camoflouge from head to toe. The guy in front of me stopped to stare at her and said, "why hello Rambo." She busted out laughing. Anways, the shoes probably would have completed her outfit. The open toe are not too bad, but the whole set were probably not best sellers. Sara: what a funny story. i think that guy is prob trying to pick her up too! : ) I agree as a pair of flip flops, maybe the idea maybe sort of cute but mary janes and close toe pumps, what do a gal wear with that?? ?